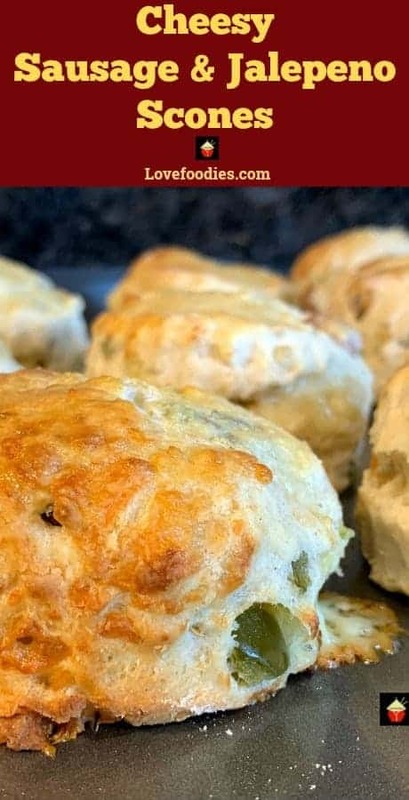 Cheesy Sausage and Jalapeno Scones or Biscuits are so light and fluffy! 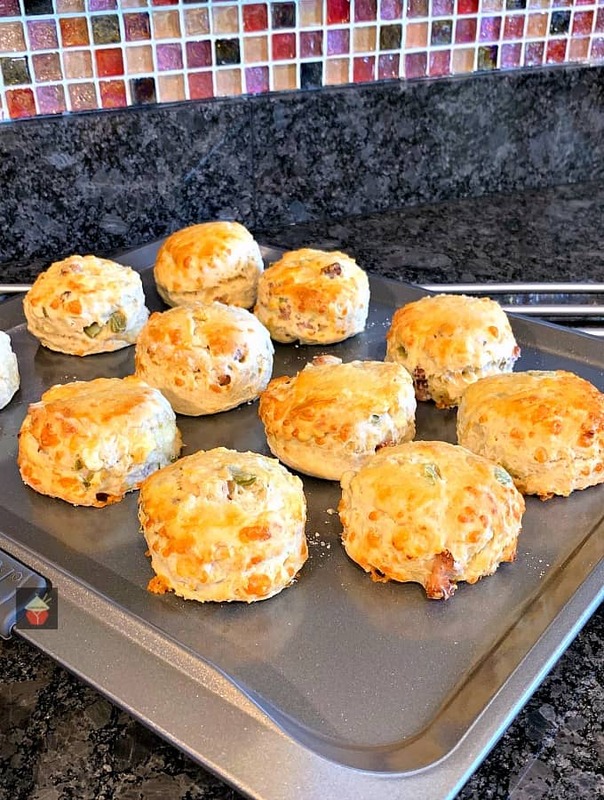 Cheesy Sausage and Jalapeno Scones or Biscuits are so light and fluffy! Perfect for breakfast, brunch, dinner, picnics, and parties. Freezer friendly too! Oh boy! 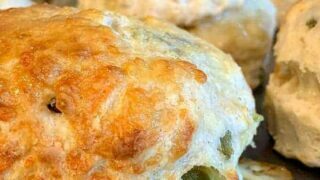 These Cheese Sausage and Jalapeno Scones are amazing! Imagine the aroma when these little beauties are baking in the oven, and do you know, it only takes 10 minutes for them to bake? So if you’re impatient like me when food is cooking, at least you know you won’t have to wait long before you can have a lovely soft, fluffy scone! 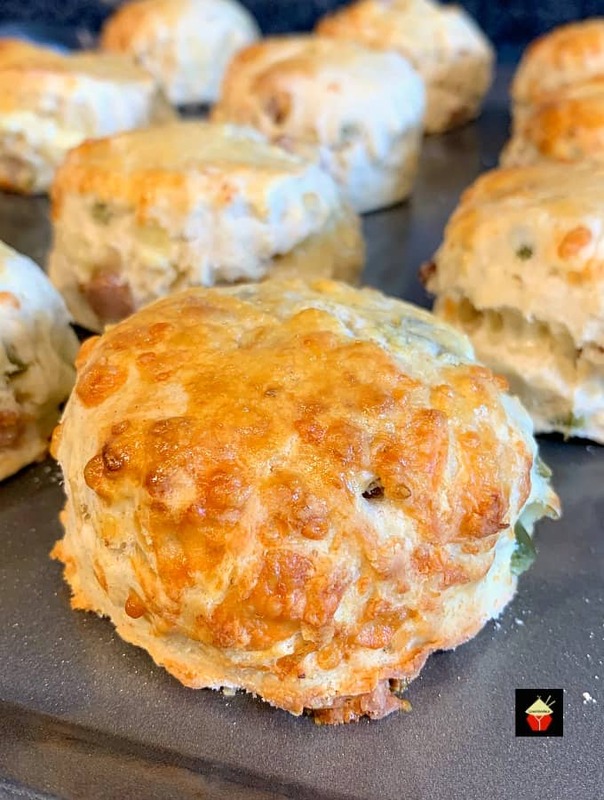 Cheesy Sausage and Jalapeno Scones, or, in some parts they are known as biscuits, are a perfect accompaniment to a main meal, perhaps you can make these to go with a nice casserole, such as our lovely Slow Cooked Beef Ribs and have these scones to mop up all that glorious gravy! Maybe you’re thinking of some tasty ideas for lunch boxes or a picnic. Well, these certainly travel well, just pop them in a lunch box and away you go! What about if you’re going to or hosting a party, perhaps at Thanksgiving or a July 4th party. A batch of these will certainly go fast so you will need to consider making plenty! For this recipe, I’ve gone easy on the ‘heat’ by only adding a few tablespoons of chopped jalapenos. I could have added more but my stepson wanted to take some for his school lunch so I made them mild. Feel free to increase the jalapeno amount to your liking! 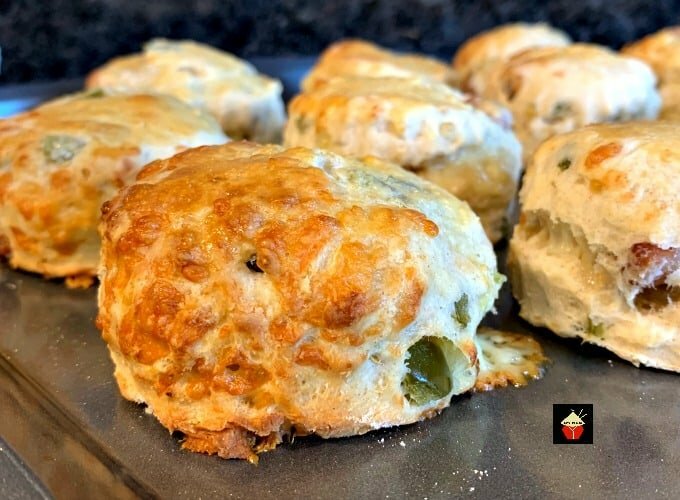 When these cheesy sausage and jalapeno scones come out of the oven, the best way to enjoy these is to pull them apart at the waistline (around halfway up the scone you will see where it will split open nicely without using a knife to cut in half), and spread a generous amount of butter on each half and enjoy! Oh my! If you wanted to make these for a party, or perhaps a Game Day event, maybe to take to a potluck, you could certainly make these ahead and simply warm through in the oven before serving or eat them cold. Either way, they’re delicious. Spread some of Nanny’s Jalapeno Jelly over each half for extra deliciousness!. Use a small cutter and make mini ones for finger food. The options are endless so please do enjoy! 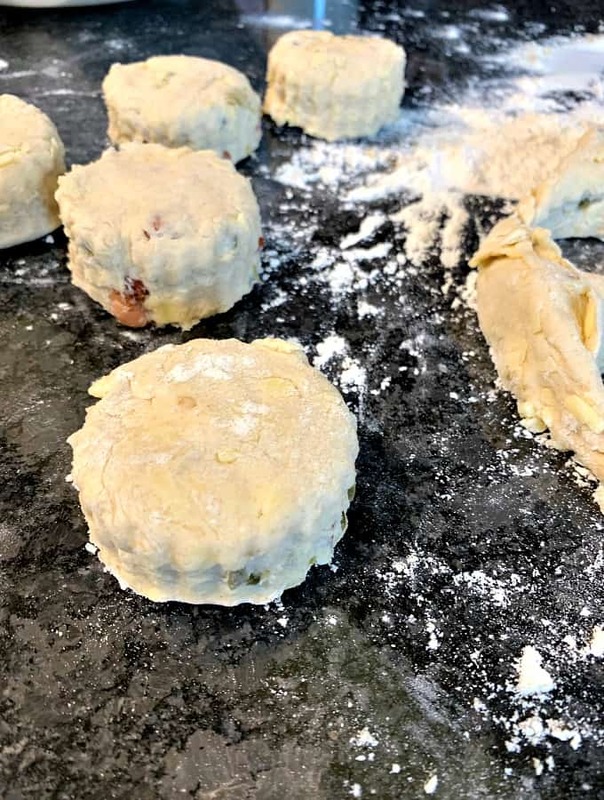 These scones are the softest, lightest and fluffiest, moist and flavourful, and remember when you make this recipe, light hands make a light scone! Be sure to follow my tips and you too will love this recipe. 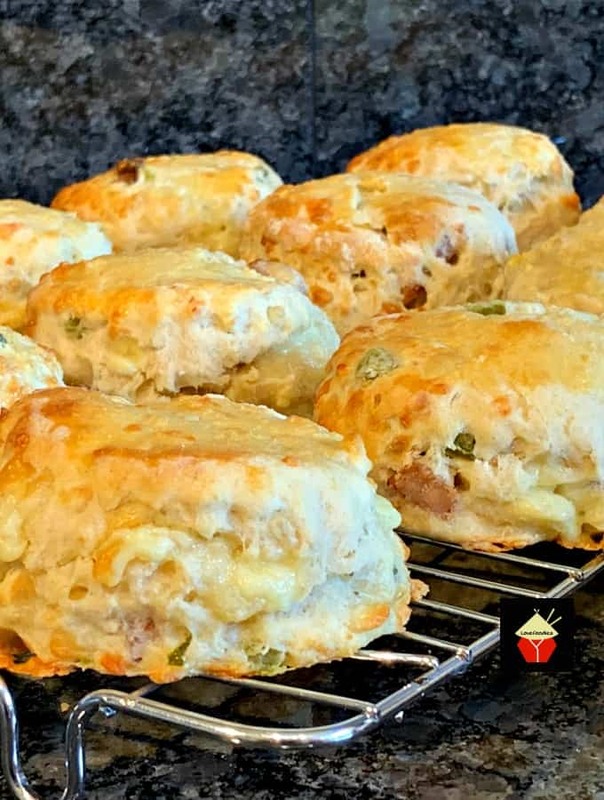 So let’s see how you make these lovely Cheesy Sausage and Jalapeno Scones. NOTE: Please ensure you use Self Raising Flour for this recipe and not All Purpose / Plain Flour. I cannot say if making your own mix of Self-raising will work. 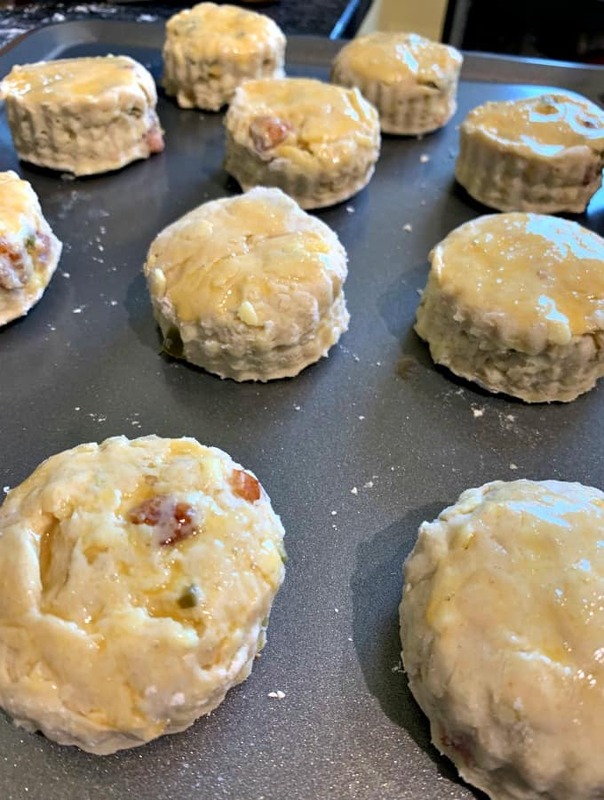 The best scones need to rise properly and not taste of soda or baking powder, and so the above ingredients are what I can advise for best results. 1. 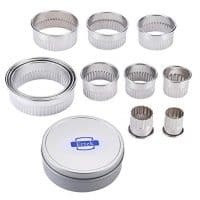 Preheat oven to 220C/ 425 F / Gas 7. Also, preheat your baking tray. 2. 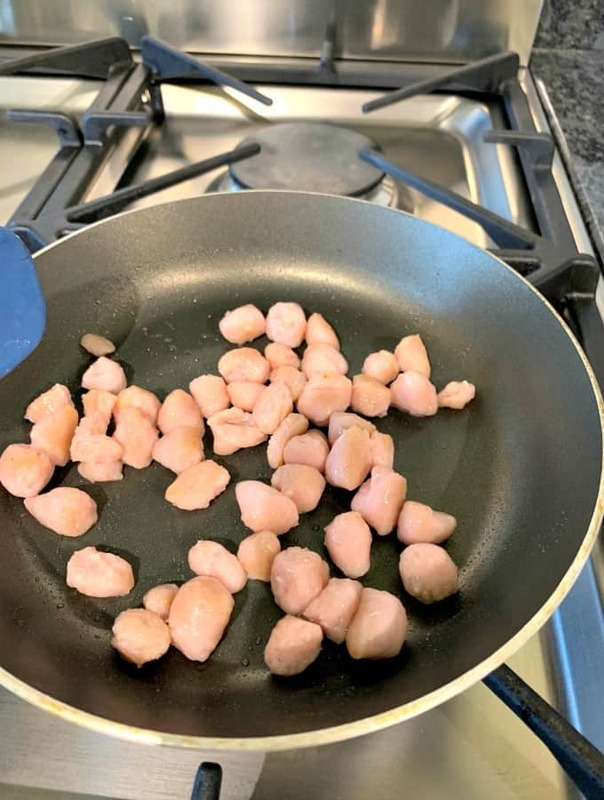 Using a pair of scissors, cut the sausages into small pieces and fry in a pan until golden. Set aside. Chop the jalapenos into small pieces and place on kitchen paper if you have used the pickled type. 4. 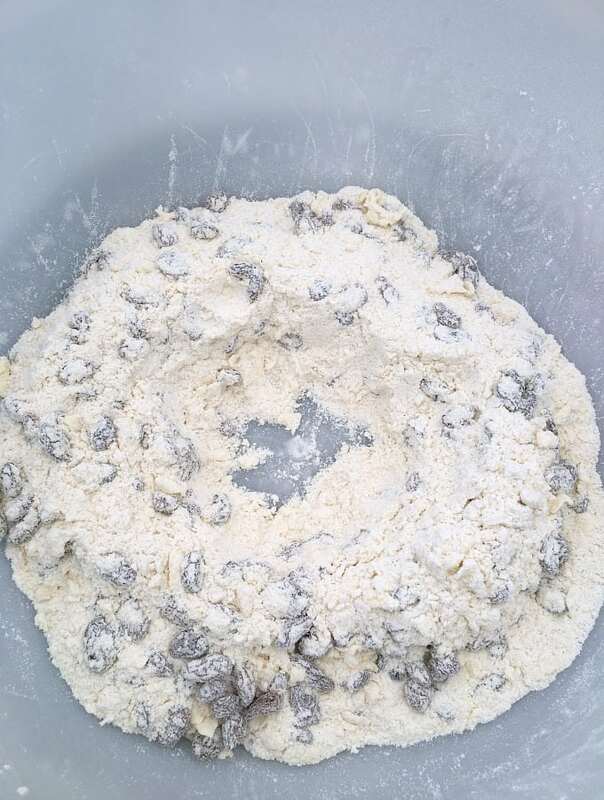 In a mixing bowl, add the sifted flour, salt, pepper, dried thyme, and baking powder, and combine. 5. Add the butter and rub in with your fingers until the mixture looks like fine crumbs. 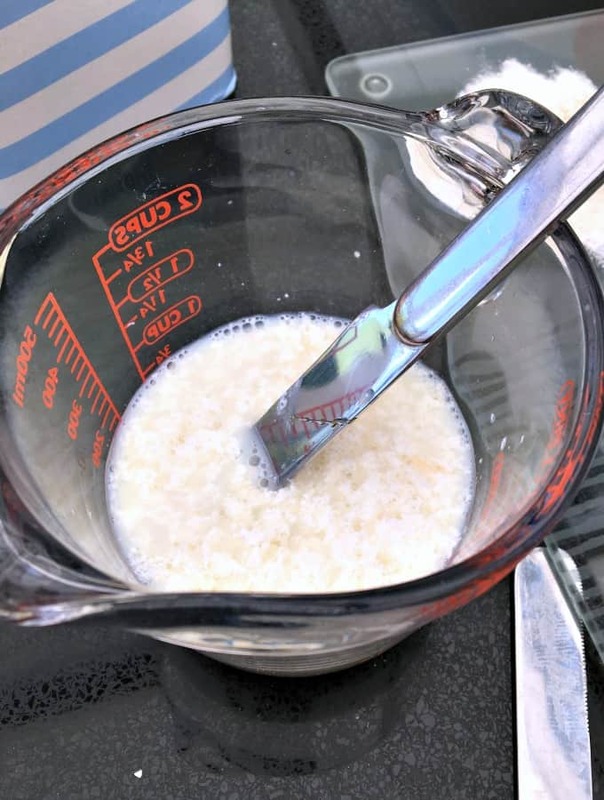 *If you have a food processor, you can add the above and pulse until combined. 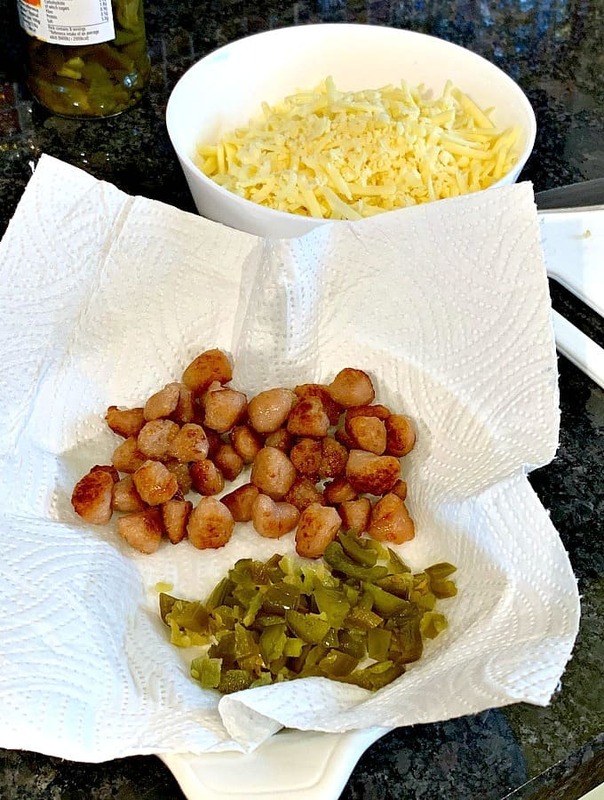 Using a flat bladed knife, stir in the sausage, jalapenos, and cheese. Combine everything. 6. Put the milk into a jug and heat in the microwave for about 30 secs until warm, but not hot. Add the lemon juice, then set aside for 2 minutes. 7. Make a well in the dry mix. 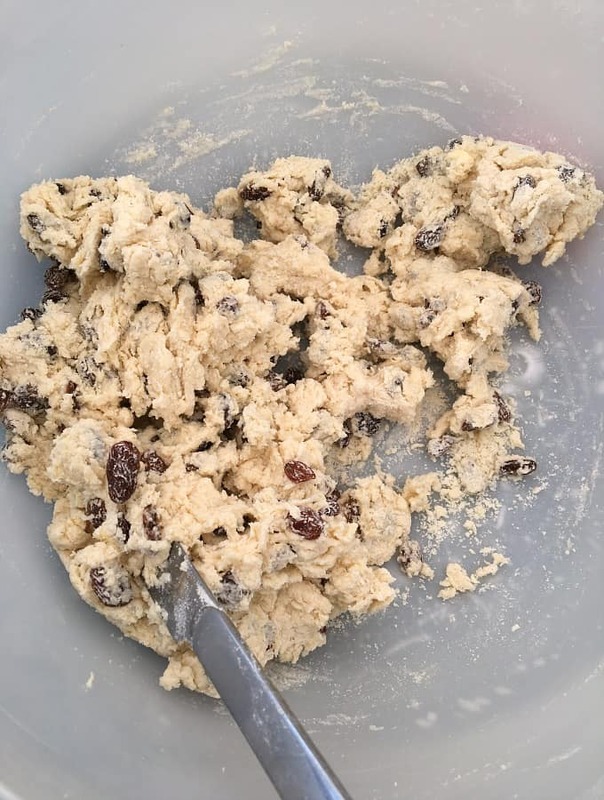 (The photo below shows a mix using raisins, but you see the idea of making the well). then add the liquid and combine it quickly with a flat bladed knife. 8. When it starts coming together, I use my hand to gently gather the dough around the side of the bowl so it’s nice and smooth. 9. Once combined, place it on a well-dusted work surface. It will be quite a wet dough at first. 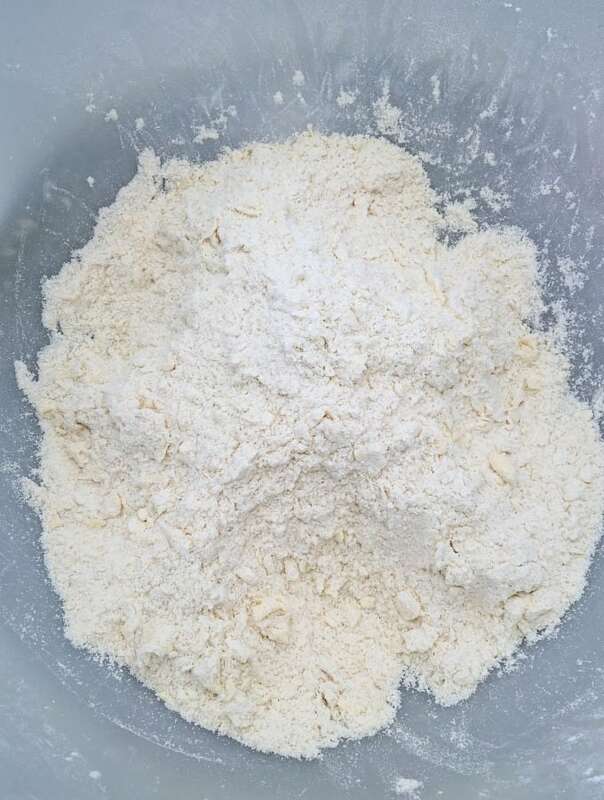 Dust some flour on the work surface and place the dough on the surface. 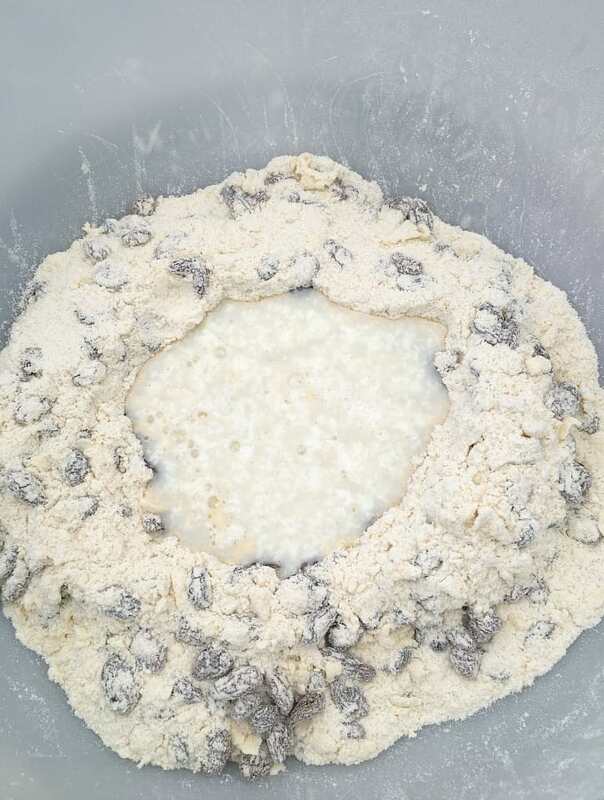 Shake some more flour on the dough and your hands, then fold the dough over 2-3 times until it’s a little smoother. Pat into a round about 4 cm (1 1/2 inches) deep. 10. 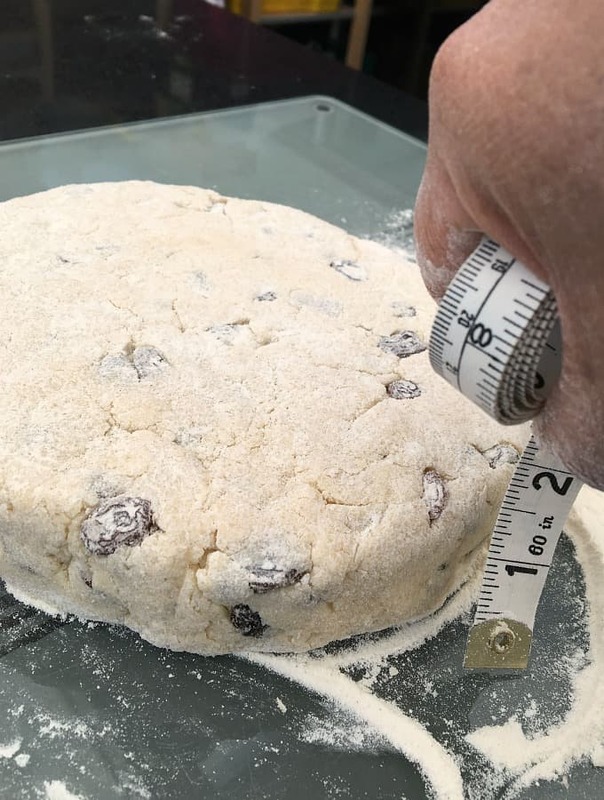 Take a 5cm (2 inches) cutter and dip it into some flour. 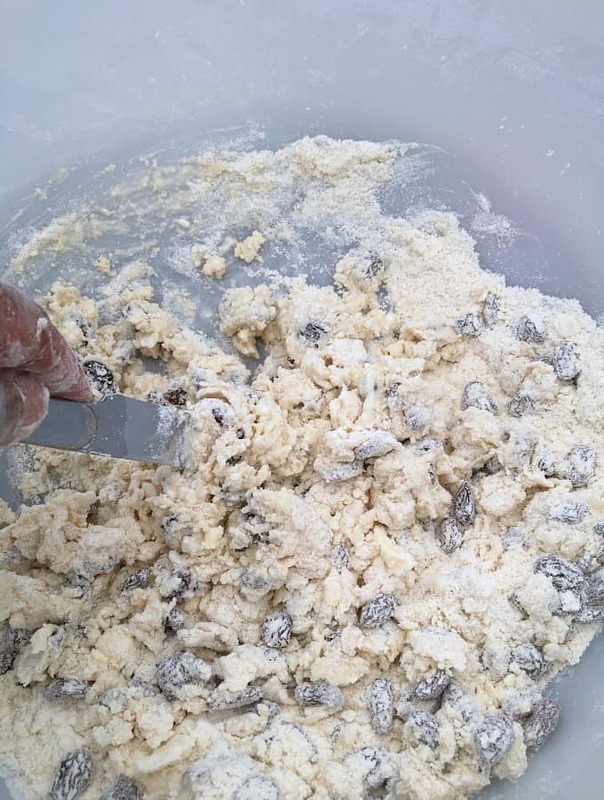 Plunge in a single movement into the dough, then repeat until you use up the dough. *** See tip below for cutting. By this point, you’ll probably need to press what’s left of the dough back into a round to cut out another four. Try not to overwork the dough, be light with your hands when reshaping. 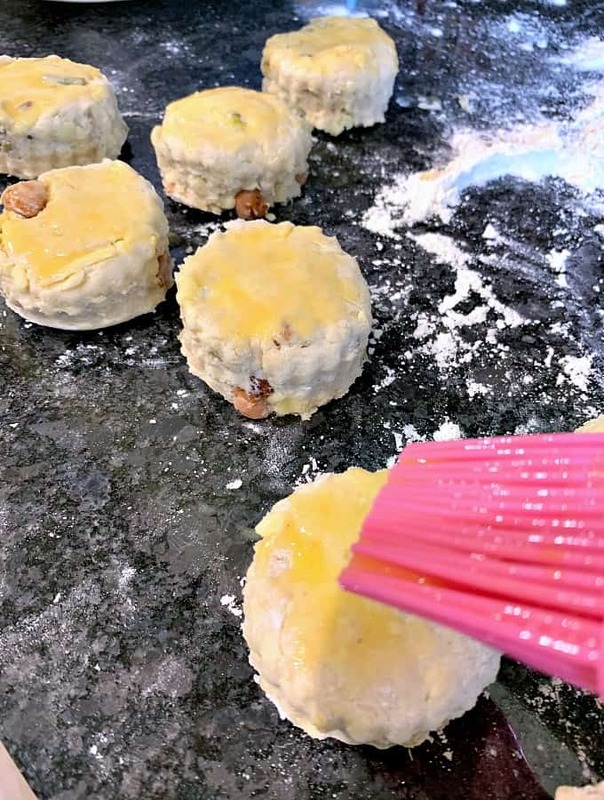 To ensure your scones rise vertically in the oven, when you use your cutter, be sure to cut the scone in one vertical action straight down through the dough. When removing the cutter, DO NOT do a twisting action, but remove the cutter straight up. 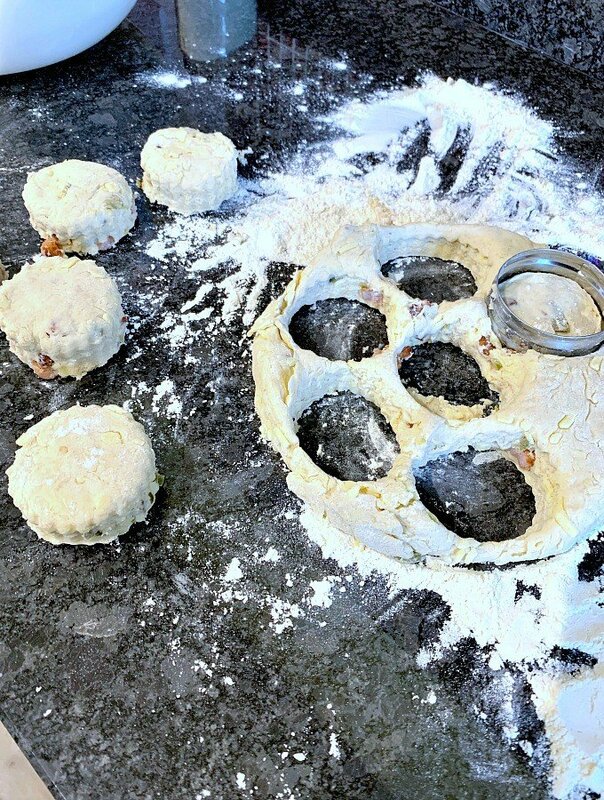 If you twist the cutter, this will destroy the structure of the dough and you will not get the scones to rise properly with the classic break apart in the middle look. then carefully place onto the PRE HEATED baking tray. 12. Bake for 10 mins until risen and golden on the top. 13. Pop the scones on a cooling rack or serve warm from the oven. 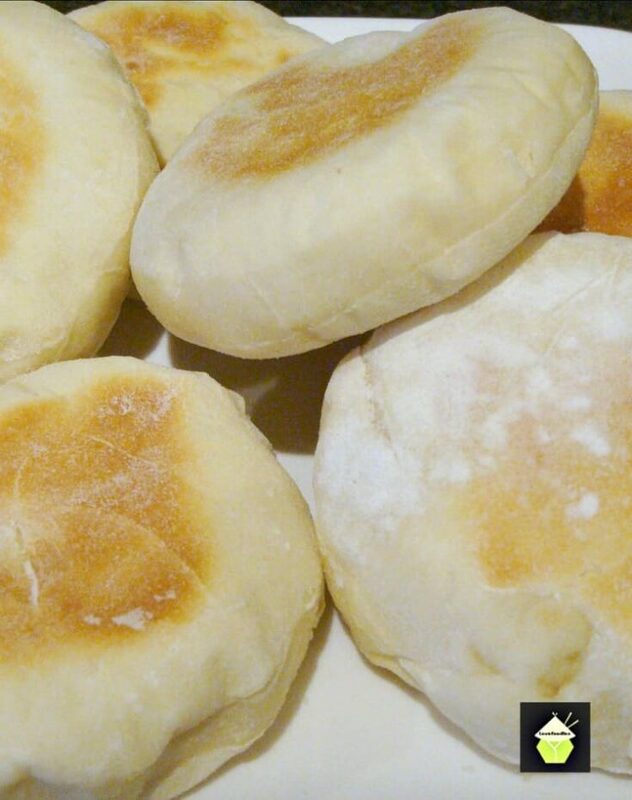 These scones will freeze very well once cooked in an airtight bag, just defrost and reheat if you want them warmed through. Delicious! Here's a selection of classic English Recipes for you to enjoy! 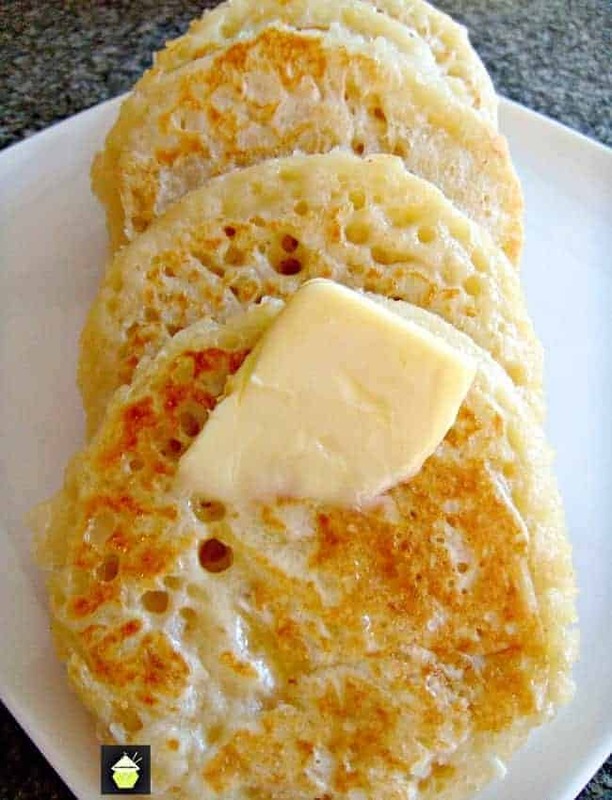 Perfect Warm Crumpets, great for breakfast or anytime! Serve with your favorite jam, or eggs and bacon, delicious whichever way you like them! 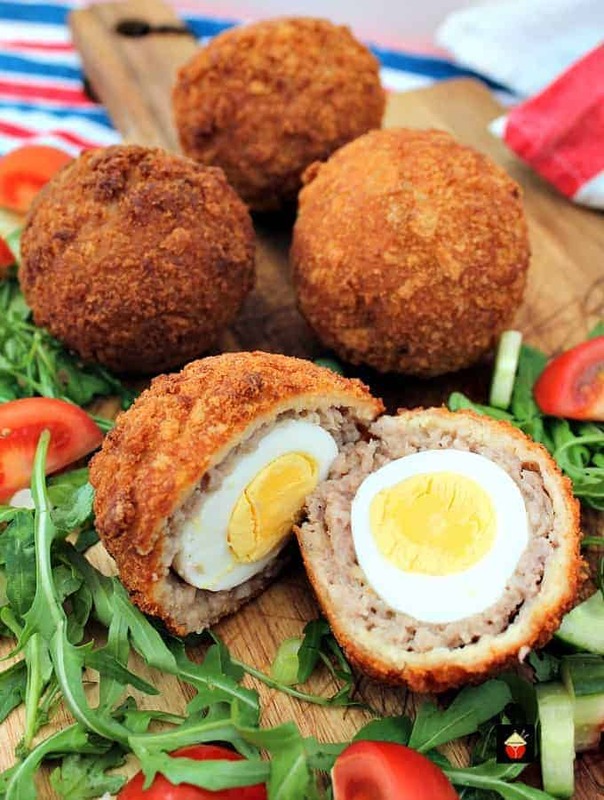 The Best Homemade Scotch Eggs, a popular British snack, perfect for a picnic, breakfast, or any occasion. Delicious eggs wrapped in sausage meat and coated in crispy breadcrumbs. 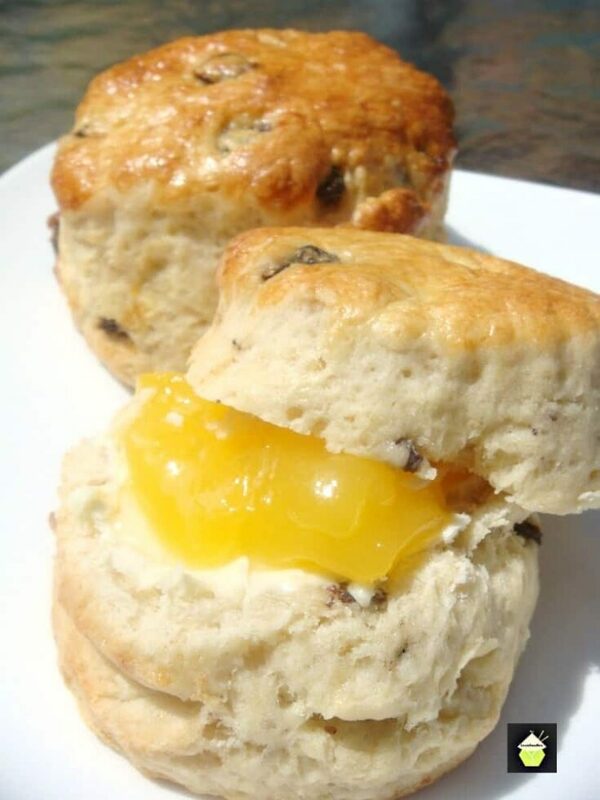 Classic English Scones. Quick and Easy to make, moist, light and fluffy! The BEST EVER British Beer Battered Fish and Chips! Great flavours and don't forget your shake of vinegar and sprinkle of salt! 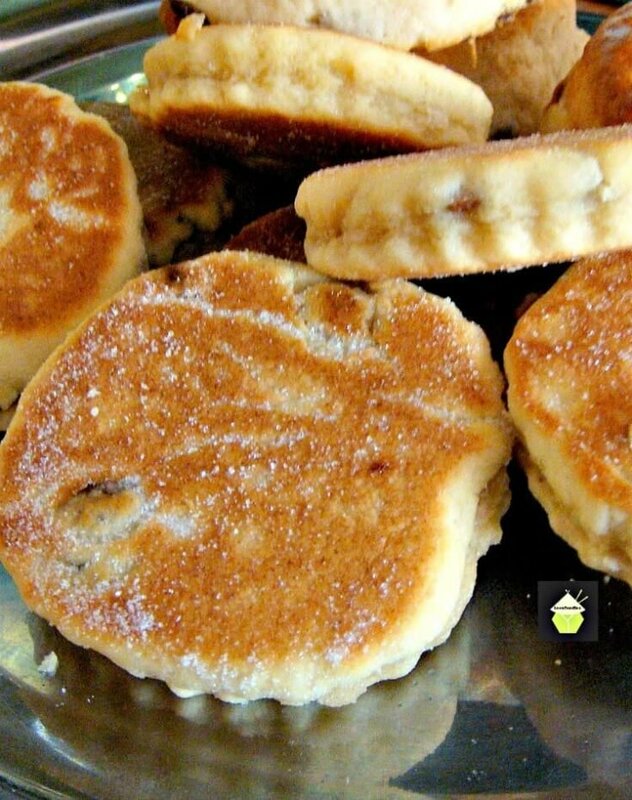 Welsh Cakes; An old family recipe, traditionally served warm, simply with a little butter on the tops! 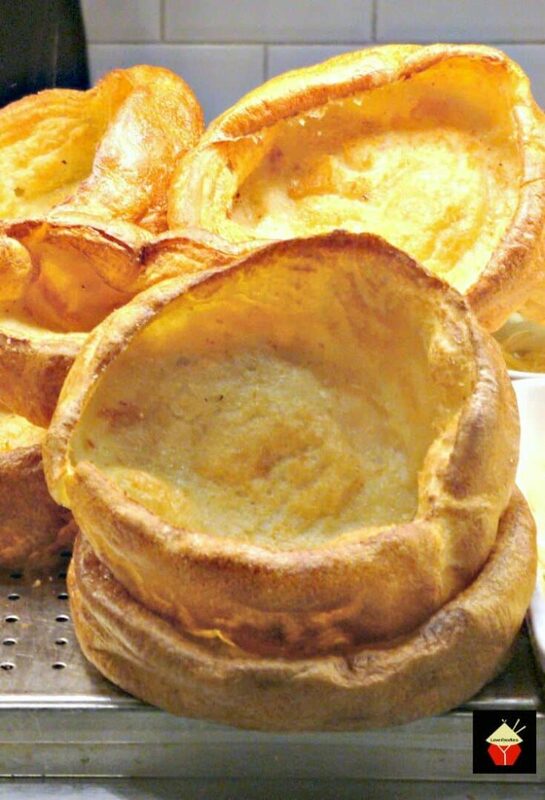 Yorkshire Pudding, a.k.a. popovers are so delicious! Serve as part of a main meal with lots of gravy, or as an appetizer and fill them with goodies. You can also serve these as a dessert, adding some nice fruits or pie filling and ice cream! You decide. They are so yummy! 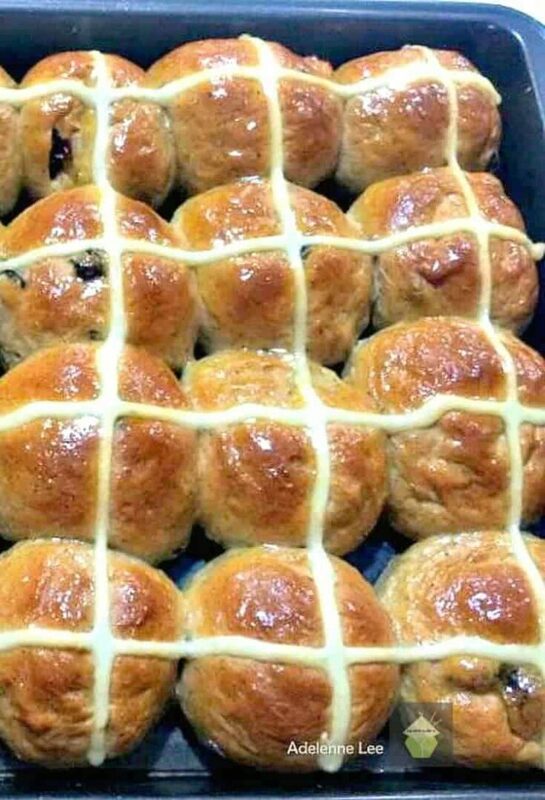 Easy Hot Cross Buns are a wonderfully soft, sweet, spiced bun, traditionally made for Easter time. Serve warm or cold, split open, toast and spread some butter and your favourite jam! Delicious! 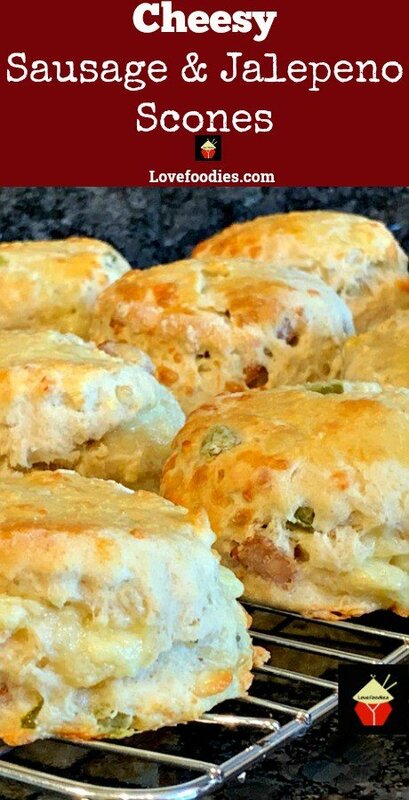 Cheesy Sausage and Jalapeno Scones or Biscuits are so light and fluffy! Perfect for breakfast, brunch, dinner, picnics and parties. Freezer friendly too! 3. Chop the jalapenos into small pieces and place on kitchen paper if you have used the pickled type. 7. Make a well in the dry mix. Then add the liquid and combine it quickly with a flat bladed knife. 8. 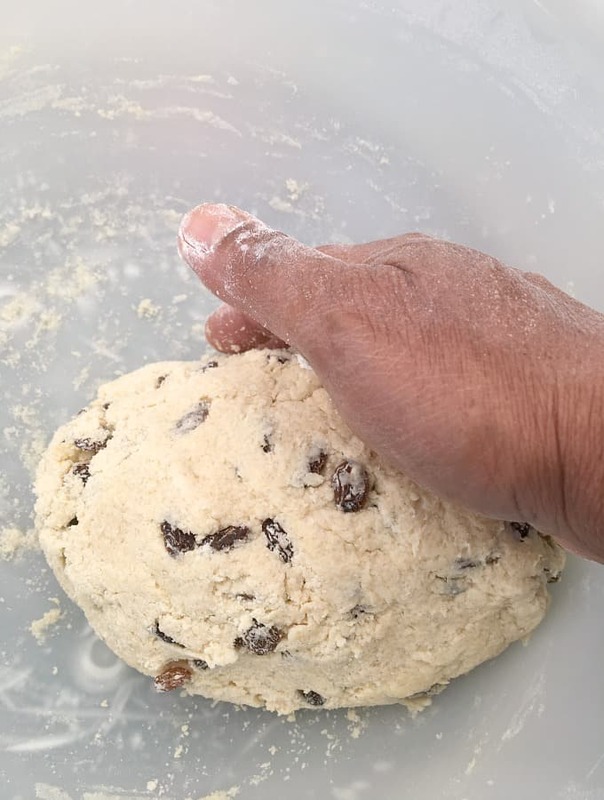 When it starts coming together, I use my hand to gently gather the dough around the side of the bowl so it's nice and smooth. It will be quite a wet dough at first. Dust some flour on the work surface and place the dough on the surface. 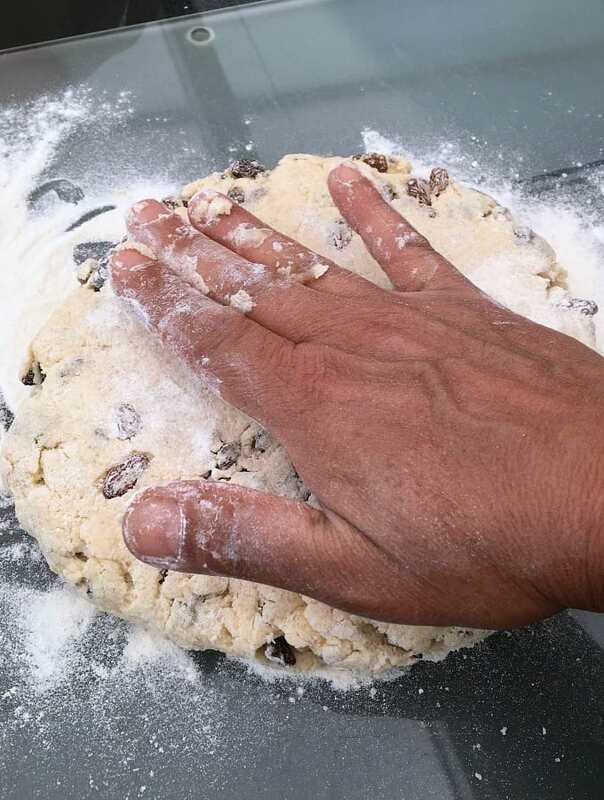 Shake some more flour on the dough and your hands, then fold the dough over 2-3 times until it's a little smoother. Pat into a round about 4 cm (1 1/2 inches) deep. By this point, you'll probably need to press what's left of the dough back into a round to cut out another four. Try not to overwork the dough, be light with your hands when reshaping. 11. Brush the tops with beaten egg, then carefully place onto the PRE HEATED baking tray. 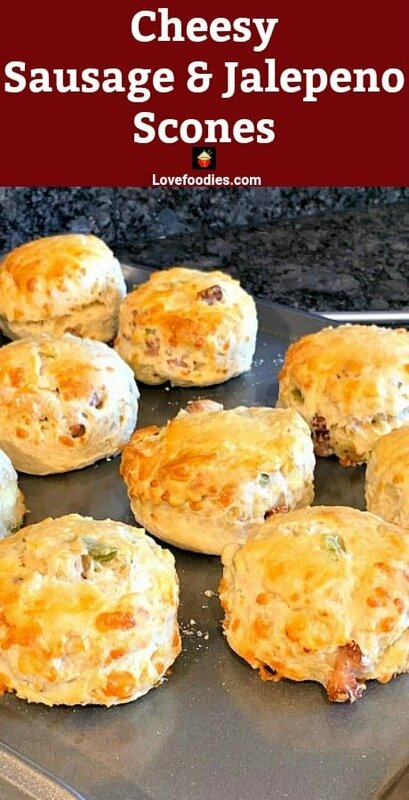 These scones will freeze very well once cooked in an airtight bag, just defrost and reheat if you want them warmed through.